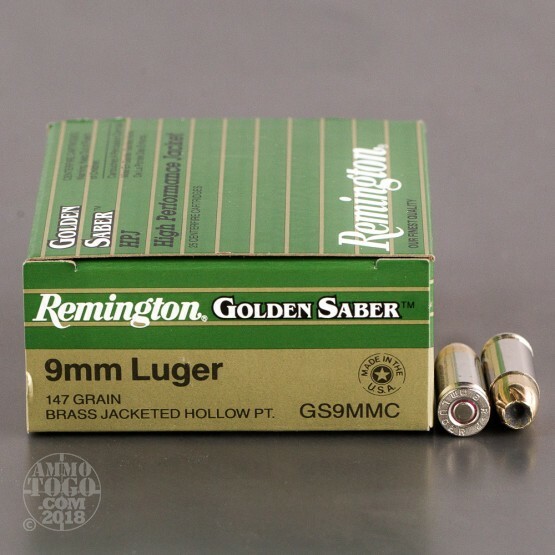 This is 9mm Remington Golden Saber 147gr. Hollow Point Ammo. 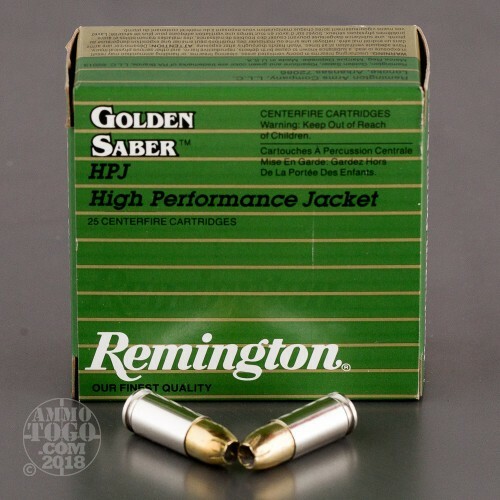 The Golden Saber High Performance Jacketed Hollow Point handgun ammo showcases Remington's continuing advances in bullet technology. No other handgun cartridge offers so many high-performance features for home security and law enforcement applications. Some of these features include: A nickel plated case for smooth functioning in all types of handguns. An exclusive brass bullet jacket which controls mushrooming and releases energy over a longer distance, compared to copper jacketed bullets. 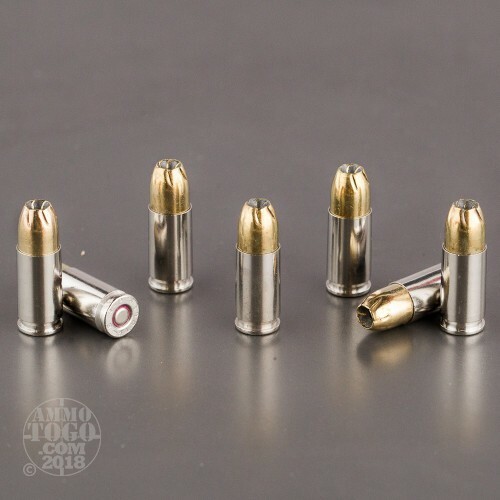 The nose cuts of the bullet go completely through the bullet jacket to enhance mushroom initiation over the widest ranges of practical velocities. The reduced nose diameter greatly increases accurracy over a wide range of distances. The primer and case mouth is sealed for moisture protection and the primers are triple checked during the manufacturing process, to ensure the most reliable functioning handgun ammo manufactured. The powders are treated with flash retardants to greatly decrease the amount of muzzle flash. This is a premium personal protection and law enforcement round. 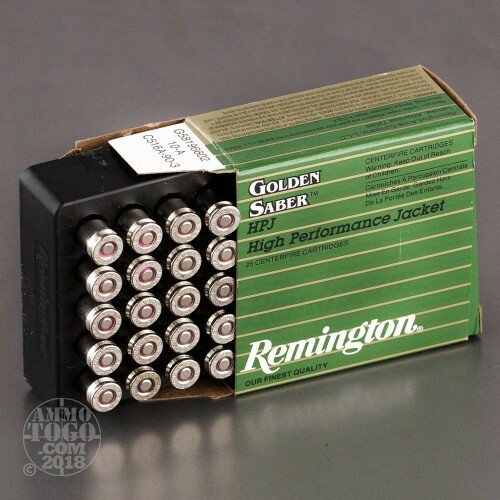 This ammo is packed in 25rd. boxes. Good performance, even out of a shorter barreled compact. 100% reliable feed. Lighter felt recoil than 115gr loads with almost no muzzle flash. I prefer the extra punch of the heavier 147gr load. And who can beat the price? This is one of two 147gr loads that I actually use. This round along with the HST are real performers with good penetration and expansion. I usually stick with the 124gr Federal Tactical Bonded. Good deal for 25 rnds. Accurate, feeds flawlessly, penetration and expansion were all excellent and at this price it should not be passed up.